My friend Amy brought these cookies to the swap. 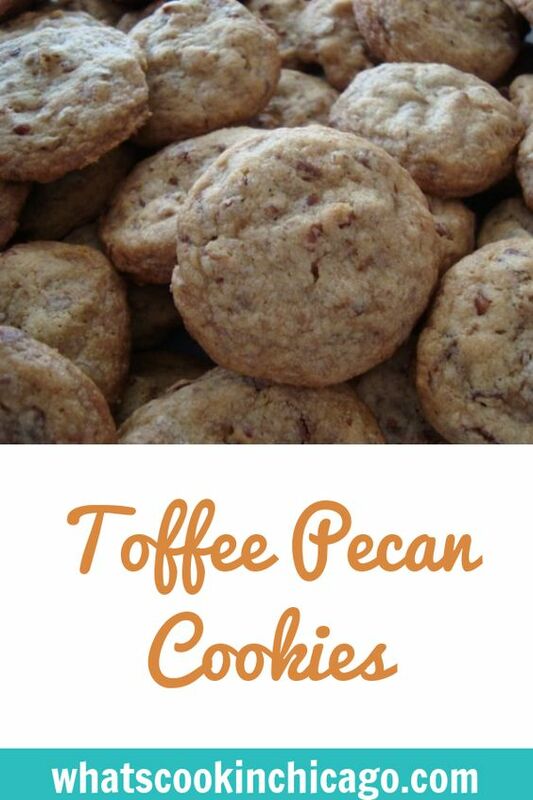 Toffee happens to me one of my fave candies so naturally I loved this cookie. Even better is that Amy added more chopped toffee than the recipe called for! Position rack in the centre of the oven and preheat the oven to 350 F. Line two baking sheets with aluminum foil and spray the foil with nonstick cooking spray. Sift together the flour, baking powder, baking soda and salt into a medium bowl. Set aside. In the bowl of an electric mixer, using the paddle attachment, beat the butter and sugars at medium-high speed until light, about 2 minutes. Beat in the eggs, one at a time, mixing well after each addition and scraping down the sides of the bowl as necessary. Beat in the vanilla extract. At this point the dough will look curdled. At low speed, add the flour mixture, mixing just until blended. Using a wooden spoon, stir in the toffee and pecans. Drop the dough by rounded tablespoonfuls onto the prepared baking sheets, spacing the cookies 2 inches apart. Bake, one sheet at a time, for 14 to 16 minutes, unitl the cookies are starting to turn golden brown around the edges. Let the cookies cool on the baking sheets for 2 minutes, then carefully transfer them to a wire rack and cool completely. Makes about 48 cookies. These sound delicious. I have a bag of toffee bits I need to use up and this would be the perfect way to do so.